It’s spring — and for some of us, it’s also allergy season. If tree pollen is your trigger you may have already starting sniffling. The season usually starts at the end of March/beginning of April and pollen counts in Southern Ontario, in particular, are already high notes Dr. Susan Waserman. Waserman works at Hamilton’s McMaster University specializing in Allergy Clinical Immunology. Monitoring pollen reports is part of the job. She’s been treating patients of all ages, for all types of allergies for more than 25 years. TARA LOSINSKI: Have you ever suffered an allergy yourself? SUSAN WASERMAN: Oh my goodness, yes. That’s what drove me to this field. [Laughs] I’m a long-standing tree, grass and ragweed allergic rhinitis sufferer and that’s what got me interested. And over the years, with better treatments, proper treatment — I was on allergy shots — I stayed well. And it’s an interesting field because it’s evolving. Some of the advise I gave years ago has been turned on its head — especially in the area of food and in the area of pets in the home. But a lot of the messages have stayed consistent: If you’ve got an established allergy, you need to avoid for the most part. 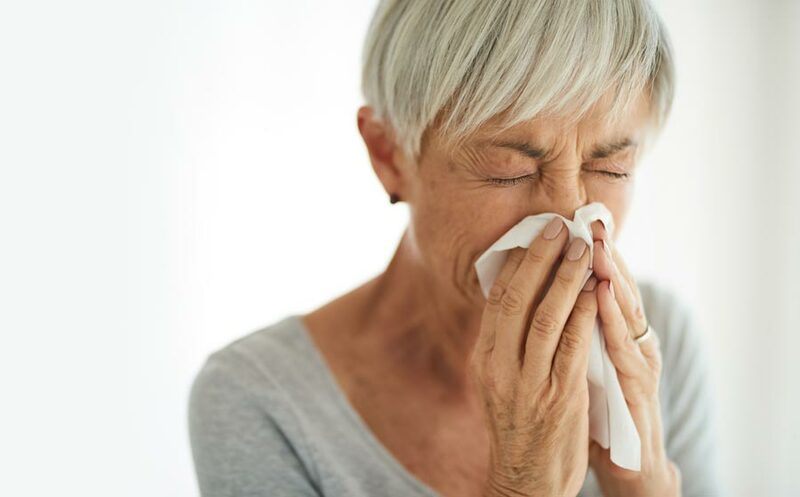 TL: Do allergies lessen with age, as our immune system dampens? SW: Well, the usual pattern for people who develop allergies as youngsters is that they’re pretty symptomatic up until their 40’s. After that, the symptoms seem to dissapate for reasons that are unclear. But not everyone’s disease reads the books. … And it’s not uncommon now for me to see people with pretty significant allergy up until their geriatric years. So things are changing. The population is more allergic in general. TL: Why is allergy on the rise? SW: It’s probably a combination of things. The most popular explanation is this hygiene hypothesis where we are thought to be living too “cleanly.” What we’ve seen over time is the immune system, instead of being busy fighting infection, has become deregulated and has become allergic. But there have been other explanations as well. The microbiome; the type of bacteria that we’re exposed to and harbor in our body may be important in determining who develops allergy. And vitamin D exposure. In this part of the world many people are vitamin D deficient, which may play a role. In the case of peanuts, the age of exposure has contributed to the problem as well. For the past 20 years or so we’ve been telling people, ‘Avoid. Avoid. Avoid allergenic foods as a means of prevention.’ Now we see it was likely the wrong advise. In avoiding, people may have been made to be more allergic. So now the recommendations are: introduce in infancy. And if you have a family history or are nervous about doing so, see an allergist before you introduce. TL: Is there anything we can do, or not do to help? SW: One is not going to trade off all the developments in hygiene to avoid allergy. What we need to do, as much as possible, is don’t do things that encourage allergy like smoking. Pollution is a factor for either triggering or exacerbating allergic disease — that should be avoided as well. But a lot of it has to do with awareness. These are not often just colds, in the case of seasonal allergy. Be aware. Speak to your doctor. There’s a lot of good over-the-counter medications now; antihistamines – non-sedating ones being favoured. And moist of your readership will be aware of those, things like Reactine or Allegra. And Intranasal steroids are probably the main stay of treatment. TL: Why are they better? SW: The nasal steroids tend to be better because they’re anti-inflammatory against a wide variety of substances. And they tend to be more affective at reducing congestion, which is what most allergic individuals will complain about. For some sufferers, antihistamines are more than enough. They will block histamines, the majority will not block other inflammatory mediators but some will – they may have mild anti-inflammatory activity. But not the extend that intranasal steroids do. TL: And about antihistamines, are they safe for people over 65? SW: The antihistamines that are not good for anybody, 65 or otherwise, are the first generation’s. These are your Benadryl’s and the short-acting, very sedating, impairing antihistamines. They’re not only a problem for older individuals but they’re also a problem for the young as well. People are sleepy during the day. They may not perform as well at exams or at work or operating a vehicle. The second generations are things like Reactin and Allegra. Two available by prescription called Patadine and Blasting, they are also safe for people over 65. People who should be careful, in terms of the second-generation antihistamines, are the ones who have some sort of congenital cardiac defect. And If you’re on multiple medications, you always have to check about whether or not the drugs interact. And grapefruit juice will affect antihistamine absorption, not unlike other medications. So the quick and easy answer is that the newer, second-generation antihistamines are safe with the same precautions as you would for any other medication. TL: What other things can people do? SW: Proper diagnosis is key. It helps to know what you’re allergic to, which an allergist can help you with and you can practice some rational avoidance. If it is pollen; windows shut and air conditioning on. You can avoid outdoor work when pollen counts are highest. But at the end of the day, we advise people to pre-medicate and lead a normal life. If you know that you’re a pollen sufferer, start your antihistamine a couple of weeks in advance. And often people do reach for over-the-counter before anything because it’s easy. And there is a big safety profile with these drugs and that’s really the message for your audience. Don’t be afraid to treat and don’t suffer in silence — it’s a waste of time. TL: You mentioned that the field of allergy is evolving, what have we learned to help the grandkids? SW: Probably the most obvious advise is the area of foods, which is early introduction, in infancy — peanuts, especially. And it seems to be the rule for other allergens like milk and egg. And things such as avoidance of smoke and irritants. We used to tell people not to have pets at home, now it seems that being born into a house with cats and dogs can actually be protective against developing allergy. The other thing that may be helpful is in young babies and infants, keep the skin well moisturized. Eczema and dry skin seem to initiate the process of food allergy and other allergy. These breaches in the skin barrier are like the gateway to developing allergies. So even if your child has no rash or eczema, keep them well-lubricated. TL: It is that time of year, any other advise for people with seasonal allergies? SW: Don’t suffer symptoms without seeing your doctor. Allergy is not trivial but it’s been trivialized. ‘Oh it’s just a runny nose. Oh, it’s just asthma.’ At the end of the day these are very impairing in terms of sleep and social life. And we now have very good medications – over-the-counter and by-prescription. And also, don’t be afraid to ask to see an allergist. People make a lot of assumptions about what they’re allergic to and they may be all wrong. It may not be that you’re allergic to trees, grass and ragweed but a new cat that you purchased at the same time.